That seems like a great idea to me. Anyone able to let me know? I guess we’ll see next week. The only issue I have is, how are the stakes really anchored? I mean, if it looks stupid but works, it ain’t stupid. If you do nothing, the roof on that house will definitely come off, the way this homeowner has it setup right now does not prevent roof shingles from ripping right off and does not protect against flooding. It’s just an attempt to make sure the structure stays mostly grounded, because if the roof gets ripped off, its a total loss. I would have boarded up the windows as well. 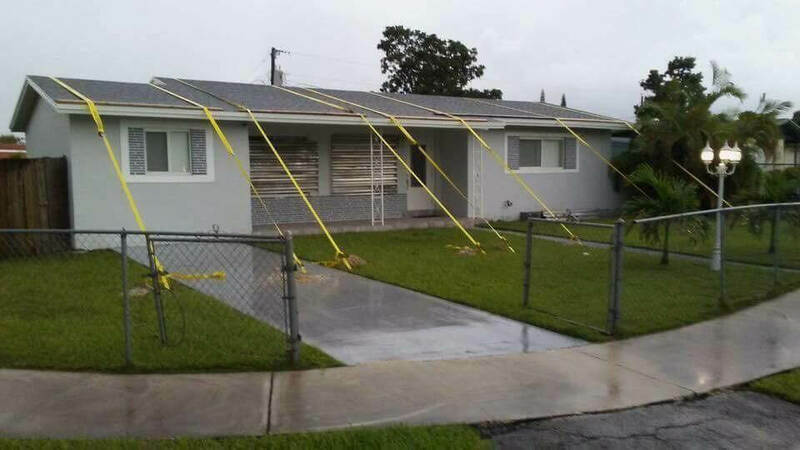 I just googled it right now, there is really such a thing called hurricane straps for this sort of thing. It looks like this is generally put into place while the home is being built. Personally, I would tarp the roof and then put straps over the tarp and anchor them deep into the ground on each side. Apparently there is a whole science behind it, but I don’t live in a hurricane prone area so I am not a master of the arts, sorry. I’m not sure a tarp would be a good idea. What if the wind went under the tarp? Now you’d have made an excellent wind-catcher and it would probably rip the anchors right out off the ground, and then you’d also risk losing the roof, too. Some sort of a tight, strong net would probably be better — if it was tight enough, it’d still protect at least most of the shingles and there’s no way wind could catch it. So if there are hurricanes there every year, why not either build better structures or move? Every year these images of makeshift protection turn up and it just seems that they should be building with concrete and solidly constructed roofs rather than this. I agree. This is a bit of a different topic, I live in Arizona, we have a Stupid Motorist Law that pretty much says if stupid people drive through flash floods they get fined and pay for their rescue. Pretty much every single time it rains we get pretty gnarly flash floods, and people drive around the barriers and warning signs and almost every single time someone dies or becomes stranded in a life threatening situation they put themselves into. Pretty much what I’m getting at is there will always be people ignoring warnings and doing whatever they want and they’ll either die or be put in life threatening situations. People in hurricane prone areas have not adapted to having hurricanes, it’s kind of odd to be honest with you. It’s pretty much a flash flood tornado in a large area, you’d think they’d like have better structures, better flood mitigation, better emergency shelters, but people in those areas don’t want to pay extra for safety in the form of local government or even themselves. I would have thought that bylaws would dictate the building regulations so they could be tailored to the risks of different areas… Roofing that stays in place during a hurricane would be my suggestion for that area. If it costs homeowners any extra they won’t do it. It’s purely American greed (I think I can say this, I’m an American, I invoke my “I’m an American” card). They probably do have something (maybe?) but older structures typically get grandfathered into the old ways, generally speaking that’s how it works here. 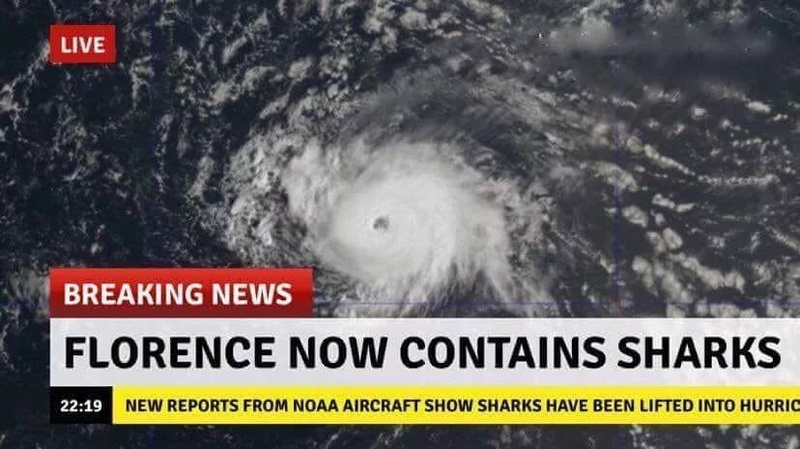 Sharknado was real all along…..